The vertical drop from summit to base is 2871 ft. The average difference in altitude between base and summit of Ski Resorts in Italy is 3087 ft. The high point of the ski resort is located at an elevation of 6398 ft. 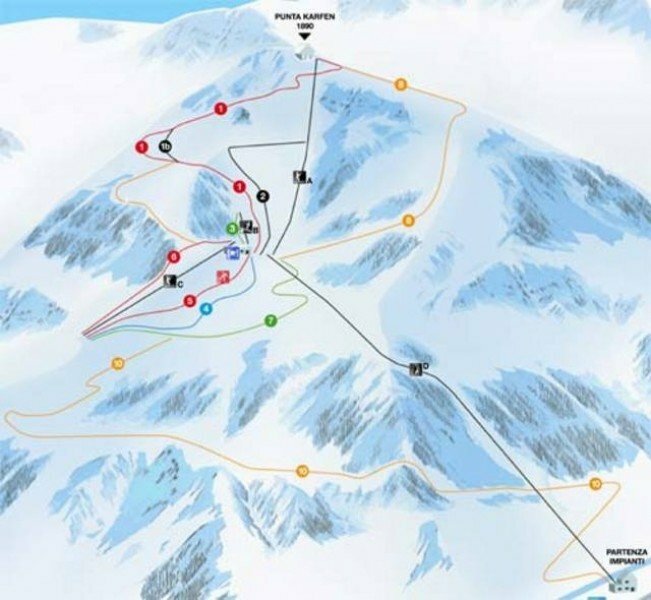 The day pass at Ala di Stura is €20 making it one of the 10 cheapest ski Resorts in Piedmont. Ala di Stura is a beautiful little resort located close to the impressive Uja di Ciamarella that is as high as 3767m! 12 km of all-category trails make for the ideal family resort, that is capable of grooming all of the trails everyday. Being on of the smaller resorts in the region and mainly beginners and intermediate trails it is perfect for those who want to start getting into winter sports in a breathtaking environment. 4 lifts will make sure you reach the trail of choice fast and safe. Next to the alpine skiing and snowboarding you can enjoy here, you will find an elaborate system of x-country trails, the longest trail being 35km long. Come here and enjoy the great skiing Ala di Stura has to offer.